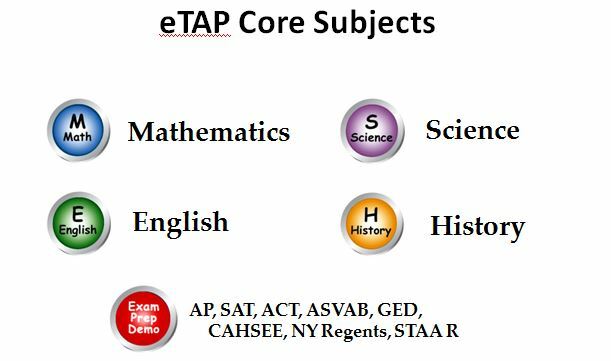 eTAP’s Mission is to help every student succeed and schools ranking UP Watch the testimony video. The text has been measured by the Microsoft reading level tool to be at or below grade level. This means the text uses short sentences and words. 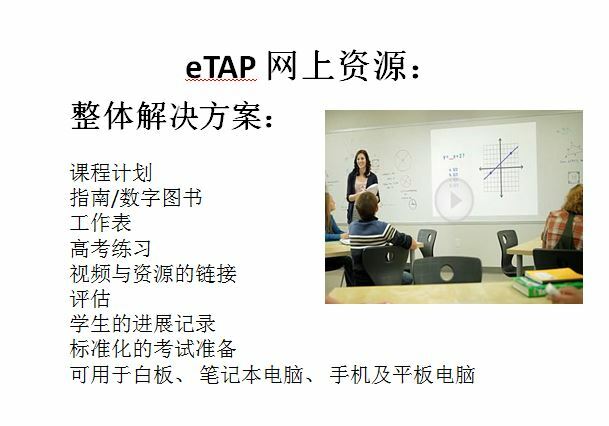 eTAP combines easy-to-understand primer style instruction with questions released from standardized tests. Pre-tests allow students to focus on what they need to learn. Instructional units are short to allow students to easily master the content. A variety of learning resources are provided so each student can select those that best fit. 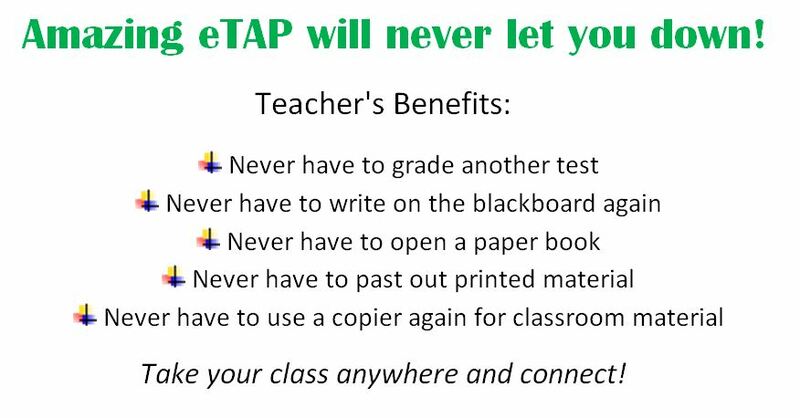 eTAP is built to empower every student succeed and help schools thrive – grow rapidly as well as backup with same highest education quality to students who choose to or have to do home schooling. 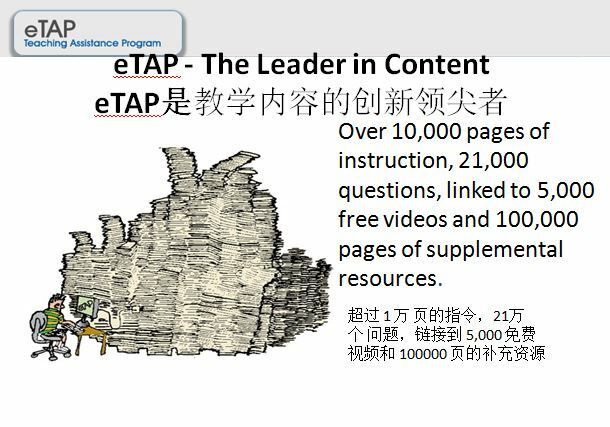 eTAP personalized content has increased the Success of all students including those with different learning styles and English as a second language. I. If you are students of public school or private school, eTAP empowers you with total freedom to do pre-test, practice test to mastery your subject to achieve best final exam result. Same time eTAP empower teachers with features of monitoring students’ learning progress and option to edit contents to fit that schools education requirement. I: 如果您是公立学校或私立学校的学生, eTAP使您有完全的自由来做预测试、练习测试以掌握您的主题以实现最佳的最终考试的结果。 同时eTAP赋予教师的功能: 1）监控学生的学习进展 2)选项以编辑的内容以适应学校教育的要求 3)软件的自动批卷精确省时。外加双文凭机会-见 II. * Canada & USA Contact us 加拿大和美国的学校或学校董事会或当地政府教育供应商订购eTAP服务, 学校和教师如何使用这些功能的,请联系：For those regions have our represents, we will direct you to work with our agents. II. If you are considering to do home schooling or already doing the home schooling, then Great News to you that, by using eTAP alone, you will graduate and receive a diploma from a California private school Pacific International Academy which is an extension of eTAP service. You are required to pass each subject’s midterm and final exam that must be completed in addition to the pre, practice and post test for each lesson. As we know, California and Taxes are the two states among 50 states stand out for the highest education standards.